Potatoes are on my list of best comfort foods. They go with just about any meal and you can fix them many different ways: baked, mashed, or cut into strips and fried – YUM! 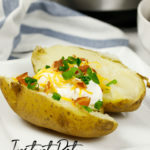 However, baked potatoes are normally easy to make but they do take, what seems like ages, to cook. Then along came the Instant Pot. The pot that can just do about everything at a fraction of the time. And it turns out DELICIOUS! Step 1. Pour 1 cup of cold water into your Instant Pot and add the trivet that came with your pressure cooker. Now it is time to prepare the potatoes. Step 2. Pick out 4 medium sized potatoes and scrub those spuds clean. Once they are clean, take a knife or fork to prick holes into the potatoes. This allows the pressure and steam to leave the potatoes as they cook. Step 3. Arrange the potatoes on top of the trivet in the Instant Pot. Close the lid. Step 4. Change your settings to High Pressure and your cook time to 12 minutes. 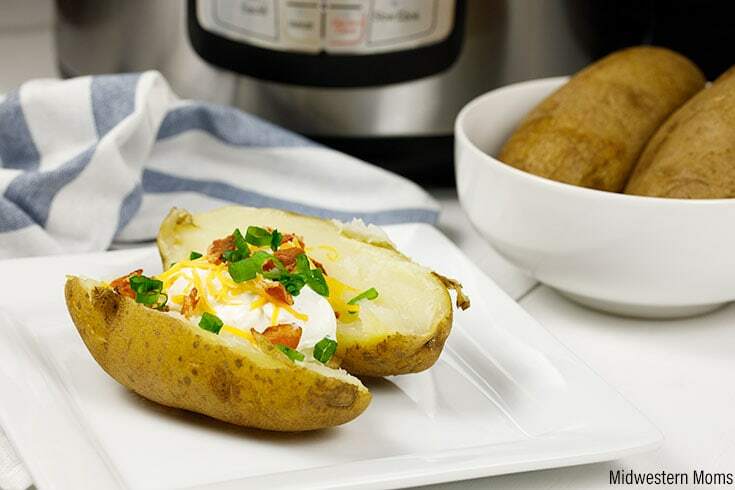 Now you can relax as your potatoes cook – or you continue cooking the rest of your dinner. Step 5. Once the potatoes have finished cooking, allow for a natural release of pressure for about 10 minutes. Switch to a quick release for any remaining pressure. Step 6. 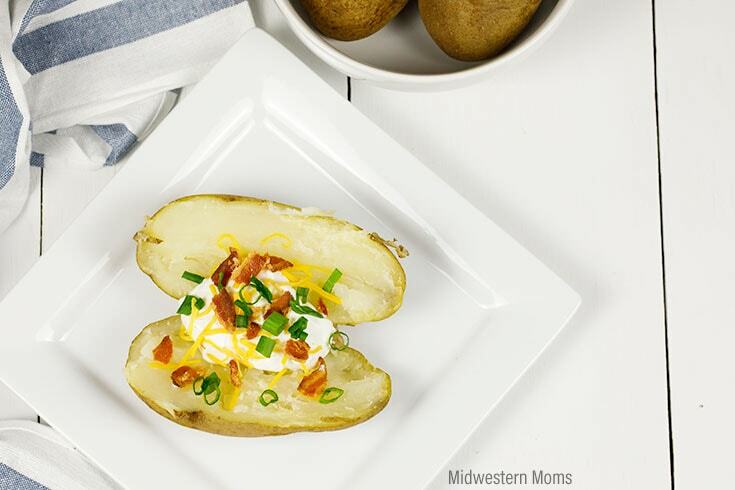 Remove the potatoes and serve with your favorite toppings. Do I only have to use medium russet potatoes? No, you may use smaller or larger potatoes as well. 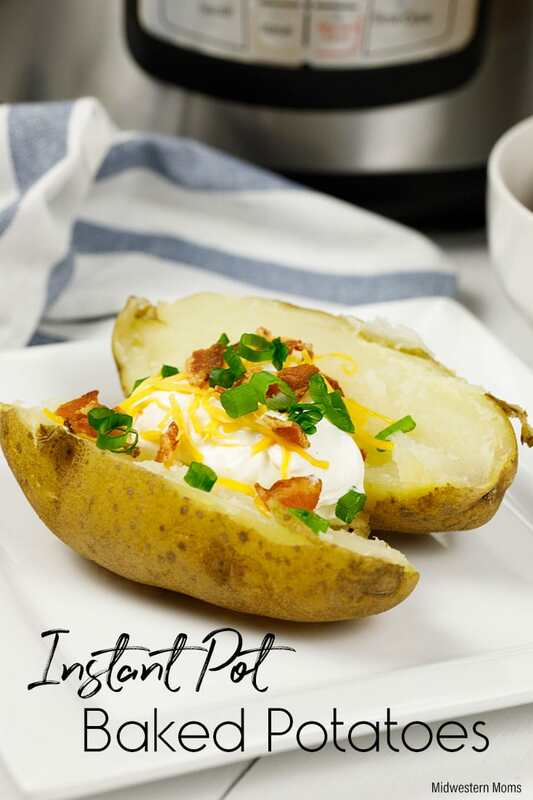 As for the type of potato, russet potatoes are the only ones I use for baked potatoes. Do I need to adjust my cooking time for different sized potatoes? Do I need the trivet? Yes! This will keep the potatoes out of the water and from getting soggy. You said cook 4 potatoes, can I use less? For the best results, use a minimum of 4 medium potatoes. If you have large potatoes, cook 3 as a minimum. Can I cook more than 4 potatoes? Yes, depending on the size of Instant Pot you have, you can cook up to 8 at a time. If go over 8, you may have to cook your potatoes longer. Another downfall of cooking more than 8, the Instant Pot will be overcrowded and therefore will not pressurize as quickly. If you are using large potatoes, I would cook a max of 6 at a time for the reason above. Again, these numbers will all depend on the size of your pressure cooker. Please use these numbers as a guide. Add 1 cup of cold water to the Instant Pot. Place the trivet in the pot. Using a fork or knife, prick holes into the potatoes. Arrange the potatoes on the trivet. Select High Pressure and Manual Time of 12 minutes. Once the cooking is done, allow for a natural release for 10 minutes. Quick release any remaining pressure after the 10 minutes. Serve with your favorite toppings and meal. My instant pot doesn’t have a trivet. What could I use in its place? I only use the trivet that came with my Instant Pot. You can order trivets on Amazon for them though. I would order one and use that.